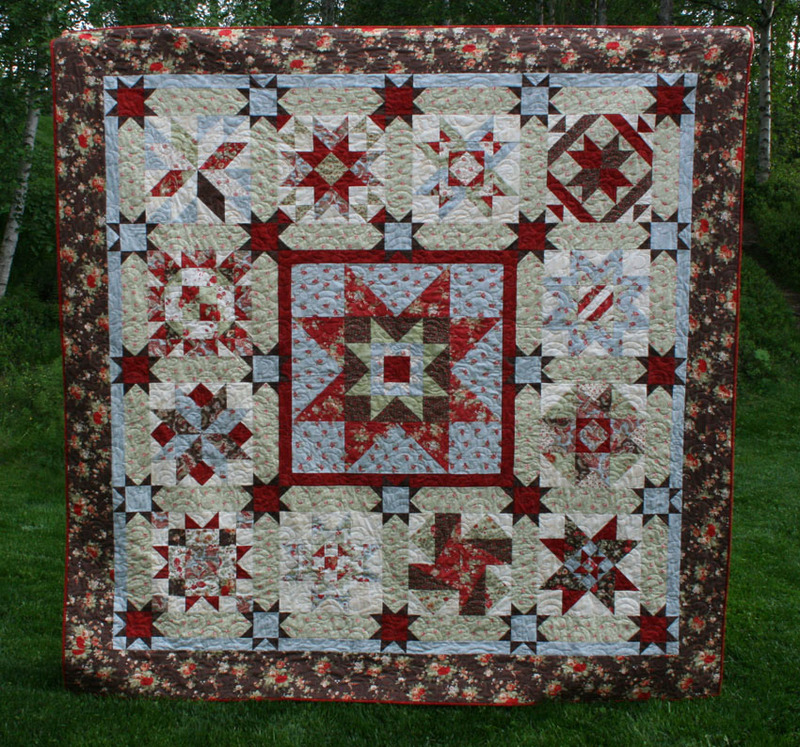 As for the give away- There is A LOT of fabrics left from making this quilt- I am sure it will be enough for a lap quilt or a couple of baby quilts. The line is Glace by 3 sisters. Hope everyone has a wonderful weekend- thanks for stopping by! Jeg melder meg på giveawayen din, rester er supre ting. Har ikke noe i mot å få besøk av " den franske generalen"
Wonderful finish for you.........both fabric lines are wonderful .......thanks for posting your finish to inspire us all. Beautiful finish!!! Your BOM is gorgeous... I love the setting you used for it too. (I might have to borrow that idea). Please enter me into your sweet giveaway Anne Heidi. I would be thrilled to win either one... but if you make me pick, I would chose the second group of fabrics, they are beautiful. Love your finished quilt. 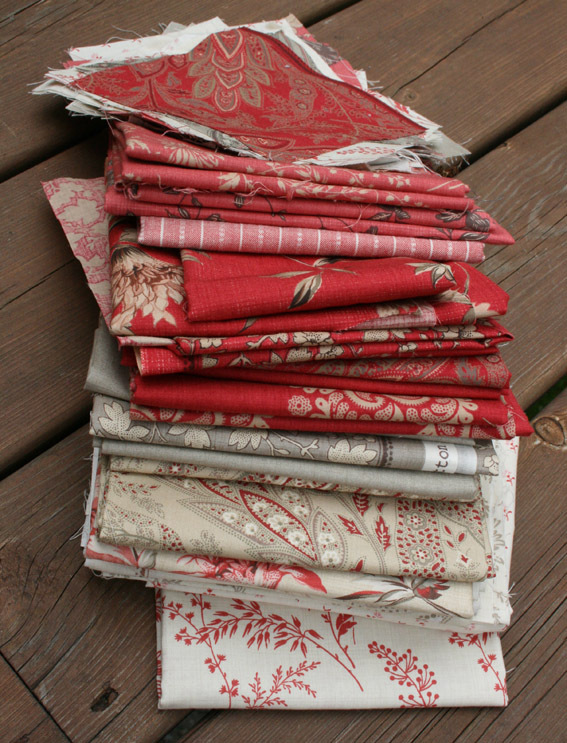 I owuld love to win any of your fabric they are great choices. Hurry to Florida we miss you lots.Love to all. Nydelig teppe, det kan du virkelig være stolt av. Well done on another beautiful finish. Your mystery quilt is lovely. Tou choice between those two ranges, Glacé I think. Thanks for offering them. Your quilt looks wonderful ... you must be so pleased. I love both your fabric bundles. They are both still among my favourite ranges ever and I would be happy to offer a home to either. Love your finished quilt! Both fabric ranges are gorgeous and it's hard to choose between the two but I'd just have to put my hand up for Glace :) Barb. 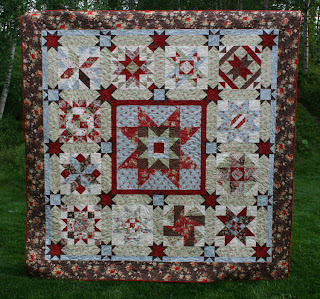 I'll bet it feels great to have finished the quilt... it's beautiful. Thanks for the chance to win the the fabric. It's difficult to choose a favorite between the two lines of fabric... but I'd have to say Glace by 3 Sisters. Your quilt is lovely!! Love both fabric lines, and will be happy to receive either bundle. Have a good week end ! You did a good job on your block of the month. a very pretty quilt. I would love to have either bundle. So nice of you to share. Helläckert täcke du fått klart där! Grattis till det! Vill gärna delta i din utlottning och vinner gärna Glace! Wonderful work. I love both lines, but I already have some Rouenneries so I would love to win the Glace.